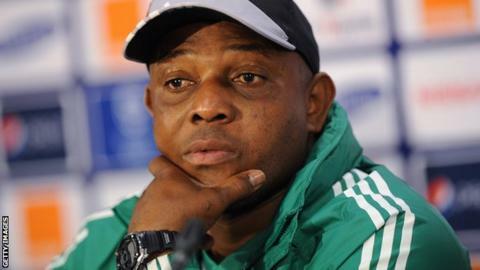 Stephen Keshi is targeting becoming only the second man to win the Africa Cup of Nations as a player and coach. The only previous coach to achieve the feat is Egyptian Mahmoud El Gohary, who won the title in 1959 as a player and in 1998 as Pharaohs boss. Keshi captained Nigeria to the title in 1994 and steered them to the semi-finals in South Africa with a 2-1 victory over favourites Ivory Coast. "Records are there to be broken," the Nigeria coach told BBC Sport. "It will be a great achievement. [But] I prefer to take it one game at a time, because no one gave us a chance to be here in the first place. "Every professional wants to have his name written in gold and I would love that, but we must work hard at every step to achieve that. "My players are playing for the country, not Stephen Keshi, but if they go one step [further] by fulfilling that record, then I will be very happy to be in such an exclusive club." Famed for steering Togo to the 2006 World Cup for the first time in their history, Keshi played in five Nations Cup tournaments with the Super Eagles and is now appearing at the tournament for the third time as a coach. On Wednesday, he comes up against a Mali team containing a number of the players he coached at the 2010 finals, when he was Eagles boss. "Things didn't work out in 2010, but that's all in the past now," he said. "[Mali] have turned things around and finished in third place last time out, but this is big for Nigeria and Mali. "I don't have anything like revenge in mind, that's for little minds. I'm here as coach of Nigeria and a citizen of my country. "What is important is to put out a great team that will create history for Nigeria. The fans are happy again but we need to go two steps further." The game in Durban marks Nigeria's fifth semi-final in seven Nations Cup appearances, with their last coming at the 2010 tournament in Angola.